Tips and tricks to elevate your technique and take your skiing to the next level. An unexpected late-April storm has laid down 10 inches of sweet, surfy powder on a quiet Friday morning at Utah&apos;s Snowbird Ski Resort. Nick Herrin, Professional Ski Instructors of America’s (PSIA) newly minted CEO, clamors into the corral at the Snowbird tram dock. Herrin, a former executive at Colorado’s Crested Butte, as well as a three-term National Team member, is happy to promote his organization’s event, but he’s also jonesing for powder turns. He need not worry. He’ll be making plenty this week; it’s PSIA’s National Academy, where ski instructors from across the country travel to ski and learn from the PSIA National Team. The National Team, selected every four years, consists of 30 men and women who are chosen to represent PSIA—a group of 32,000 members—at both a national and international level. The team works closely with regional education groups and performs clinics and demonstrations. Over the past several years, the National Team has worked on developing fundamentals of skiing that apply to any type of snow or condition, regardless of the ski being used. But for most skiers, PSIA and the notion of taking ski lessons garners images of either groms in a ski train with their hands on their knees, or a tourist taking a private lesson on his trip out West, learning to ski the steep and deep. Rather than seen as the local golf club pro who can help perfect your swing, taking a lesson in skiing is often looked down upon—a sign of weakness in a sport that prides itself on being bold. PSIA is aiming to change that through a targeted collaboration with the U.S. Ski Team. Two years ago, PSIA formed an official partnership with U.S. Ski and Snowboard and its coaching staff. Working with U.S. Men’s Alpine Head Coach Sasha Rearick, PSIA helped U.S. Ski Team members analyze their technique by applying the fundamentals of skiing. The idea is for the athlete to see how they got here—and how far they have to go. Racer Steven Nyman has attributed his comeback to the process. Herrin and I buzz a few laps before lunch, airing rollers and finding the last bits of cold snow in Mineral Basin. He eventually takes off for additional media engagements as I bounce around a few groups of National Team members and other attendees out for the week. The afternoon is spent skiing hard down the Cirque, Great Scott, and other staple Snowbird runs. We push it to the bell before I link up with Herrin again over a beer. 1. Think ahead: In bumps, a common mistake is to focus on the entry of the turn. That’s late, as you will be making linked recoveries rather than executing proactive bump skiing. Instead, focus on where you want to finish the turn. — John Kirby, Copper Mountain, Colo.
2. Tick tock: When making medium- to long-radius turns, steer the skis at a constant rate from start to finish, just like the second hand of a clock. —Timothy Burt, Blue Mountain, Pa.
3. Build up to it: Early in the season, ski a quarter of a run at your home area without stopping. Then increase to half of the run. Eventually, work your way up to nonstop runs. —Kevin Jordan, Aspen Snowmass, Colo.
4. Move to the beat: At the top of a run of bumps, think of your favorite song, and visualize turning with the music before the bumps start. Then go down the bumps humming the tune. —Marylu Cianciolo, Chicago Snow Studio, Ill.
5. The hill is your friend: Turn up the hill to slow down. Let this become the safety net in your head. Why? Because Mother Nature always balances her books. —Ron Lenker, Mount Snow, Vt.
To be a Snow Pro is to be a master of the turn. 6. Outside Ski: Start by going across the hill and initiate the turn by shifting your weight to the new outside (downhill) ski. At the same time pick up your new inside ski just a few inches. Balance over the ski with ankle flex and press into the cuff of the boot. The harder you flex in a balanced stance, the more your ski will turn. Repeat turning the other way then gradually link ski turns together. Feel the muscle of the outside ski. 7. Inside Ski: The hardest part of this drill is faith in yourself that you can do it. To do this you must feel comfortable going to a flat ski. If you can’t do that, don’t try this. Start going across the hill (looking downhill) and initiate the turn; at the same time pick up your “old-turn” uphill ski and roll the ankle of your new inside ski until it is flat while moving in the direction of the new turn. Like with the outside-ski drill, flex the ankle and be sure to balance over the ski. Be patient. Repeat on other side, and then link the turns. —J.K. 8. Flex for control: To extend your legs into the trough of a bump, you must have already absorbed the previous crest. Approach bumps with a relaxed athletic body and flex at the hips, knees, and ankles. Absorb the crest with these flexed joints so that your hips and shoulders do not get thrown vertically. Then you can extend your legs into the trough, turn, check your speed, and continue. —Paul Geoghegan, Ski Bradford, Mass. 9. Short and fast: Crud causing problems? Change from carving wide-groomer arcs to short, fast turns by making your legs move like you’re running down a flight of stairs. —Paul Piscitelli, Cannon Mountain, N.H. Check out Marcus Caston&apos;s Crud Clinic for more tips on how to ski chunder like a pro. 10. Have patience: Stand sideways on a relatively easy, groomed slope and slowly stand up taller. You will feel the skis flatten and slip down the hill effortlessly. The more patient you are, the less effort you will need, as gravity pulls your skis down the hill. —Brian Carpentier, Northstar, Calif.
12. All rainbows: Don’t be afraid to ski in the rain. The snow will probably be soft and the slopes wide open. If you stay awhile, the sky will smile back a rainbow. —Kim Holzer, Wintergreen, Va.
13. Pole to pole: To help your rhythm in turns, use your poles like a pair of metronomes. Speed up the metronome for shorter turns and slow it down for longer ones. —Scott D. Sherwood, Bristol Mountain, N.Y.
14. Bundle Up: I cannot overemphasize the impact of being cold on the hill. Buy boot warmers, heated pants, heated liners, heated gloves, and the best-quality undergarments designed for cold. It will transform your skiing. —Eduardo Valencia, Afton Alps, Mich.
15. Claws out: When you fall on firm snow, get your feet downhill of your head, just like on a slide. Turn onto your stomach and dig your toes in. Think about a “cat on the drapes”; claw your hands into the snow. —K.J. Have kids and a dog? You&apos;ll love the next one. 16. Good dog: I use this principle to teach kids how to transition from wedge to parallel turns. I ask them if they have a favorite pet and its name. If they tell me their dog is named Sadie, for example, I have them imagine that Sadie’s eyes are on the bottoms of their ski tips. I tell them for Sadie to see, they have to tip their skis up on edge so Sadie’s eyes are able to look where you are going. Without having to teach them about ski shape, or releasing and engaging their edges, they instinctively start carving their turns. Their mantra becomes, “Let Sadie see!” —Jeff Harriman, Beaver Creek, Colo.
17. One step ahead: Always be thinking and looking one turn ahead. This way, youare able to anticipate what is coming; be prepared to make any adjustments, and create fluidity as you move through terrain. —Max Brennan, Northstar, Calif.
18. Just give in: Leaning uphill on steeps puts your balance over only one leg and over the outside edge of your uphill skill—a challenging position. If you give in, widen your stance and stand on the downhill ski, you can also balance against the uphill ski. Now your position is stable and strong. You can reach your pole downhill with a slight bend in the elbow. As the pole enters the snow, that signals the end of the turn and that you’ve maximized your edging. As your skis cross under your center mass, reach for the steeps on the other side, tip your skis, and engage the edges once again. —Christopher Weiss, Toggenburg Mountain, N.Y.
19. Warm up: Instead of jumping into a lesson, take runs to loosen up, find out what conditions are like, and what you’d like to learn. —Paul Lashoto, Wachusett Mountain, Mass. 20. Be prepared: Come to a lesson with a specific goal, i.e., “I am uncomfortable skiing in bumps and want to get better.” Understand that you are the driver of your learning. You should expect to come away with one clear cue that helped you. —Sherman White, Smugglers&apos; Notch, Vt.
21. Let the ski do its job: If you find yourself twisting your upper body to hurry through the scary part of the turn, stop! Your ski is designed to make a nice round turn so let it do its job. As you start, tip the skis and allow the sidecut to get you in a speed-controlling arc, then gradually steer across the hill. This removes the need to involve the upper body. —Mary Poscover, Whitetail Resort, Pa.
22. Make contact: Place your pole vertically at the front of your boot so that your knee touches it. Your leg should be firmly against your boot cuff. If not, your body is too far back, not putting enough pressure on the front of your skis. —Witold Kosmala, Sugar Mountain, N.C.
23. All is not lost: To put a ski on in deep powder, place the tail of the ski that has come off so that the binding is out of the snow. Now click in your boot and push down so your ski goes from doing a “wheelie” to back into the pow. If both skis come off, put the downhill ski on first and then the uphill. Lost your ski? If you still have the other ski on, take it off and pretend it is a broom. “Sweep” the snow looking for the other ski. Your ski has more surface area than your ski pole. —K.J. ...moving. Ankles, knees, and hips. 24. Don&apos;t just stand there: What makes an expert skier stand out in any terrain? Continuous joint movement. Ankles, knees, and hips are opening or closing at all times. Skis take off and leave us in the backseat if we passively stand on them. Extending our joints at the beginning of a turn keeps us moving with the skis by putting our hips over our feet, and flexing our joints through the bottom of our turn allows us to continue to keep up with our boards and absorb the pressure that increases during the arc. Try this: Count 1, 2, 3 while extending for roughly the first half of your turn, and then count 1, 2, 3 while flexing for the rest of your turn. Or inhale while you extend and your tips begin to enter the fall line, and exhale as you flex and finish your turn. —Sam Cathey, Whitetail Resort, Pa.
25. How to ski glades: Start your turn at the base of a tree with the opening in front of you. Then move into the opening as you turn to give yourself more time and space. —Dusty Dyar, Crested Butte, Colo.
26. Get a grip: Allowing the ski to grip while you control the shape of the turn and speed is key on ice. As you finish one turn and start the next, transfer your weight to your upcoming outside ski before you start changing your edges. This will give the ski immediate purchase at edge change. Then steer the skis while they are gripping the snow. When you get it right, the ski doesn’t carve, but it won’t skid out of control either. Instead you will have a ski that grips the snow that you can steer. —Joshua Fogg, Aspen Snowmass, Colo.
27. Sideslipping away: The steeper the terrain, the more difficult and scary it is to start a turn. Instead of a full turn, start with a sideslip. Having controlled momentum downhill will give you a sense of what the snow is doing, move you to a different spot, and make it easier to smoothly release your edges when you are ready. Give yourself permission to sideslip as far as you need to until you feel comfortable turning. –Ann Schorling, Jackson Hole, Wyo. Want to take your skiing to the next level? Check out SKI Magazine&apos;s Online Course: "How to Break Through." 28. Fancy Footwork: Turning on skis requires footwork, which takes place inside your boots. Steering gets blended with pressure, decambering the skis, edge angle and platform angle, and with momentum and balancing. It is difficult to isolate steering unless you move slowly. Try this: Ski down a gentle incline in a wedge, letting the snow get on top of the front of the outside ski. Try to feel what it is that you are doing because that’s exactly what you will need in all of your skiing. Say goodbye to excessive skidding and body over-rotation. —W.K. 29. Earn your curve: Many skiers think they are carving just because they are on a “carving ski.” But in a true carved turn, the tails of both skis follow in the same tracks as the tips, with no skidding. —J.H. 30. Fix your flat: To shift direction, both skis simultaneously need to go to a flat ski to facilitate an edge change. Get on a relatively steep and groomed blue or gentle black with your skis across the hill. Look down the hill with shoulders square and roll both ankles so both skis are flat. Move your body down the hill staying over your skis. No steering: Be patient and just let the skis find the fall line. —J.K. 31. Brake it up: Short, straight runs with drops are great fun. To slow down, use three or four turns, losing a little speed with each turn to return to your normal skiing speed. —D.D. SKI Magazine&apos;s Director of Instruction Mike Rogan is here to debunk some ski instruction myths. 32. Myth: Keep your hips over your feet: While it’s true that most of the time it’s important to keep your center of mass (hips) over your base of support (feet), there are times when you do want your hips behind your feet, like in the bumps when you are absorbing a mogul. 33. Myth: Lean back in powder: When skis were long, straight, and narrow, leaning back made sense. Now, with wider skis, camber, early-rise tips, and reverse camber, this is a myth. Instead, center yourself on the skis and have them work together as a unit. Narrow your stance, letting your skis float on the powder and don’t use too much edge. —K.J. Think you can ski steeps like Marcus Caston? Get tips from the man himself in this Steep Skiing Clinic. 34. Moving on up: Transitioning from an intermediate to advanced skier requires taking your skills off of groomed runs. Practice lowering your hips and center of gravity off trail. This adds stability, power and the confidence to plow through variable conditions. —Calvin Conner, Alta, Utah. 35. Stay centered: As skis drop from a mogul, your ankles will try to open; pulling the feet back will keep the ankles closed and keep you over your feet. —Gary Elliott, Mammoth Mountain, Calif.
36. Moving forward: When we demonstrate “moving forward,” we usually stand across the hill and move our upper body, while it is twisted down the hill, forward across the length of the ski. Instead, just flex that inside ankle, which puts pressure into the new outside ski. —J.K. 37. You&apos;re a star: Have a friend video you. You may think your weight is centered over your boots, but the video will show reality. You’ll be surprised how much it can help. —Jimmy Brokaw, Summit at Snoqualmie, Wash.
38. Bridge the Gap: With your skis pointed across the hill, notice the gap between the snow and your downhill edges. When starting a turn, close that gap at the tip between the snow and the downhill edge. This helps you engage the ski tip, and move into parallel turn entry. —Art Menichini, Montage Mountain, Pa.
39. Even Steven: To keep yourself aligned to the outside ski, try to keep both hands and shoulders the same distance from the snow. —D.D. 40. Know before you go: Know where you are turning, your speed, the look and feel of the snow, and the sounds around you. Use these to determine your technique, like how much edge you need, or how much to turn. That way, you won’t get surprised. —J.F. 41. Slow your roll: When you’re on the verge of a breakthrough, be patient when adding speed back. Many expert skiers say they learn best by going slow at first. Learning timing is as important as the movement itself. —Brian Smith, Aspen Snowmass, Colo.
42. Test your skills: We can be a superstar on a groomer going fast. But what happens if we bring that to a crawl? On a green with a slight incline, make open-stance parallel turns. It’s hard. Gradually move to flatter terrain. Be over the center of your ski, flex your ankle into the boot cuff, and move in the direction of the turn. Once you have that dialed, take the same technique and see how higher-speed turns perform. —J.K. When the going gets bumpy, make it down smooth. There are generally three turning tactics for bumps. Most people know two of the three. There is the World Cup “zipper line,” which requires legs and knees of steel (43). Then there is the common “ride through the trough between bumps” that most of us take (44). What’s the third? The other bump to the outside of the trough (45). That side is usually soft snow and provides a good platform. Make this adjacent-bump side your focus point and ignore the troughs. I like to feel my feet push against the soft snow like I’m riding down a half pipe. This tactic helps make turn shape easier to provide speed control. You will also save your knees! —J.K. 46. Fire up the shins: Flexing your ankles is about firing muscles in your shin. Before you tackle a day of chop and crud skiing, try the following out of your boots. Place your hand on the outside of your shin. As you flex your ankle, feel the muscles in the shin engage. As you extend your ankle, try to keep those same muscles flexed. As you ski, move your ankle while you keep your shin muscles working. This will let you blast through the crud and chop without losing your balance. —J.F. 47. Just like Ted: Inclination is when the center of mass moves laterally inside the base of support. This is what allows parallel turns to be parallel. Angulation is when skiers create angles, usually at the hips or knee, so they can balance against forces and direct pressure toward their outside ski. This is what allows Ted Ligety’s hip to touch the snow. Incline into the turn, angulate out of it. —K.J. 48. Edged out: To learn edge control, go low-speed on a catwalk, using the left ski as an outrigger for stability, while the right is tipped in and out wiggling from the inside to the outside using the sidecut to change direction. Switch sides using the right ski as the outrigger and tipping the left ski from side to side. After isolating each ski, simultaneously tip both skis from one side to the other creating the perfect railroad tracks. —J.H. 49. 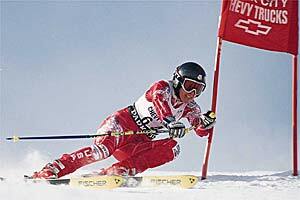 Be strong: Dynamic skiing requires dynamic conditioning. Overall body strength is essential, as strength is a confidence-builder. It helps to control the fear factor. —George Cretekos, Bristol Mountain, N.Y.
50. Find your center: On a green, head down the fall line and lift one ski off the ground. Tip too far forward. Tip up, and you are in the back seat. Level. You nailed it. Correct by flexing your ankle into the cuff of the boot so the shin is engaged with boot tongue. Do this on each ski to find your center. —J.K. 51. Take a bow: Beginners: Take a bow as you get off the lift. This will put your weight forward instead of in the back seat, where you will almost always fall. —Michael Fales, Loveland Ski Area, Colo. Tips are for kids, too! 52. Keepin&apos; it real: Yes, we would love to have our kids love skiing as much as we do. We want them to be the next Ted Ligety or Mikaela Shiffrin. However, when it comes to introducing your kids to the sport, set the bar low—like five minutes. It is all about snow play and hot chocolate. 53. Go with a pro: Consider putting your kids in ski school. Some littles take direction from others better than from their parents, as there’s less temptation to push boundaries. 54. Get inspired: If at all possible, take your kids to a ski or snowboard event. It doesn’t have to be the World Cup or the X Games. A local NASTAR race can be enough to stoke the fire. Plus it doesn’t hurt for them to see what good form looks like. 55. Build Confidence: It might take a day or two for the kids and their muscles to remember the movements of skiing. Try starting them out at a lower level group to build confidence. 56. Steady as she goes: If it is the end of the day, your children are tired. Stick to easier runs. If it is a powder day or different conditions, try not to add new or steeper terrain. It is all about the mileage, and while you may want to introduce them to their first blue or black, hold off and build up to it. —K.J. 57. Attn: Visual Learners: For some skiers, seeing is learning. Those folks should check out the online course “How to Break Though,” created by our friends at AIM Adventure U. The course is designed for intermediate to advanced skiers looking to address problem areas in their technique, and is taught by PSIA Alpine Team Coach Mike Rogan. PSIA Alpine Team Member Dave Lyon discusses the best techniques for skiing with your kids. PSIA Alpine Team Member Stephen Helfenbein discusses the best techniques for skiing in the trees. PSIA Alpine Team Member Brenna Kelleher discusses the best techniques for skiing moguls. PSIA Alpine Team Member Dave Lyon discusses the best techniques for skiing spring conditions. PSIA Alpine Team Member Jennifer Simpson discusses the best techniques for skiing crud.